For the first time since I started this blog, one of our local grocery stores stocked hatch chilies. I feel like I’ve been watching my more-Southern food blogger friends rave about them for years and could never participate in the hatch chili fun. So now that they’re here? I’m making hatch chili everything. First up: mac n cheese. I really, really loved this. The roasted chilies paired really nicely with the jack cheese sauce. I had split this into two pans with intentions to freeze one for later – but it all got eaten before it made it to the freezer. Oops! On the grill, roast the chilies over high heat until charred and blistered. Transfer to a bowl. When cool enough to handle, peel the chilies, seed, remove the membrane and dice. In a large saucepan, melt the butter. Add the diced onion and cook until nearly translucent. Whisk in flour until the mixture is a play dough consistency. Add milk, whisking constantly, and cook until starting to thicken, about a minute. Stir in cheeses and stir frequently until melted. Stir in cooked macaroni and diced chilies and season with salt to taste. 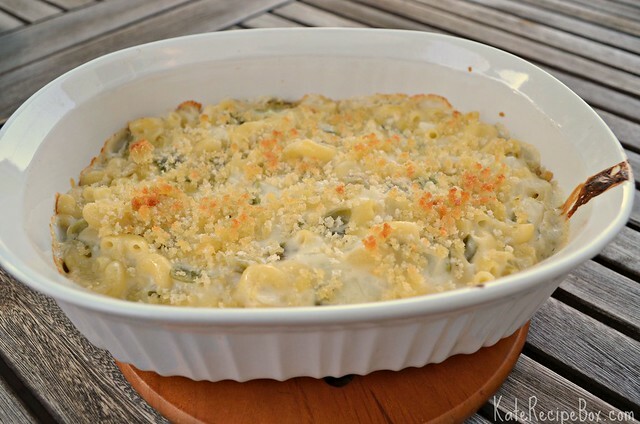 Spread the macaroni in a greased baking pan. In a small bowl, combine the panko and olive oil. Spread over the top of the macaroni. Bake at 350F degrees until bubbly, about 15 minutes. Might have to try this out if I ever get out of my pasta restaurant. This looks pretty good!